I remember the first time I made a Margarita. It was shockingly good, completely different from anything I had been served in a restaurant or bar. It wasn’t the tequila—I’m certain I was using a famous cheap gold blend, or mixto; no, it was the fresh lime juice, bright and sassy, and it raised the drink to an eye-opening new level. There’s no two ways about it: tequila and fresh lime go perfectly together; tequila and industrial sweet/sour or Margarita mix, not so much. The Margarita seems like an ideal and obvious combination of flavors; it’s peculiar there is no written mention of it until Esquire made it their “drink of the month” in December, 1953. There are tons of stories, claims by bartenders from California to Tijuana to Acapulco and beyond, each of whom invented the Margarita for some showgirl or socialite or ambassador’s daughter… yeah, right. Legends and celebrity tales aside, there are two schools of serious thought on the Margarita’s origins: the “Daisy” school and the “Sidecar” (or Picador) school. The “daisy” is basically a sour sweetened with triple sec or orange curaçao instead of (or in addition to) straight sugar, and optionally topped with a bit of soda to sparkle it up a bit. It was already a common combination in the latter half of the 19th century, and it seems unlikely that among the brandy, gin, and whiskey daisies, there weren’t plenty of tequila daisies being served in Mexico and the southwestern U.S. And anyone whose first (or second) language is Spanish already knows where I’m going with this: the Spanish word for daisy is “margarita.” Daisy school philosophy is that the drink has probably been around for a long time, not so much an “invention,” but rather an implementation of the well-understood Daisy class of cocktails. Meanwhile, over at the Sidecar school: historian Ted Haigh, whose cocktail knowledge I have every reason to respect, suggests that the Margarita is of Anglo origin, very possibly an English import derived from the Sidecar. Tequila was apparently quite popular in England in the years after WWI (I’d love to know the history of that), and the presence of the often-specified Cointreau, combined with a strong similarity to the Sidecar, and the exact match with a drink called the Picador (1937 Café Royal Cocktail Book ,) leads Haigh to his theory of the British-borne Margarita. As is often the case with classic cocktails, origins are muddy and will not get any clearer with time. Whatever the history, the fundamentals of the recipe are quite stable: tequila, lime, and triple sec, and that traditional salted rim. Shake tequila, lime, Cointreau, and simple with ice until well chilled. Double strain into a chilled cocktail glass or over ice in a rocks glass, optionally half-rimmed with coarse salt. Optionally splash with soda. Garnish with lime. The Margarita is very forgiving on proportions. I normally make this 2:1:1 version, but as often happens, the historical research for this article got me interested in another version: the 1:1:1 Sidecar model, which turns out to be quite drinkable. I have seen recipes that substitute Grand Marnier for the Cointreau. To my taste, this seems to muddy the flavors. I prefer to stick to the leaner taste of the Cointreau, or of Patron’s Citrónge. 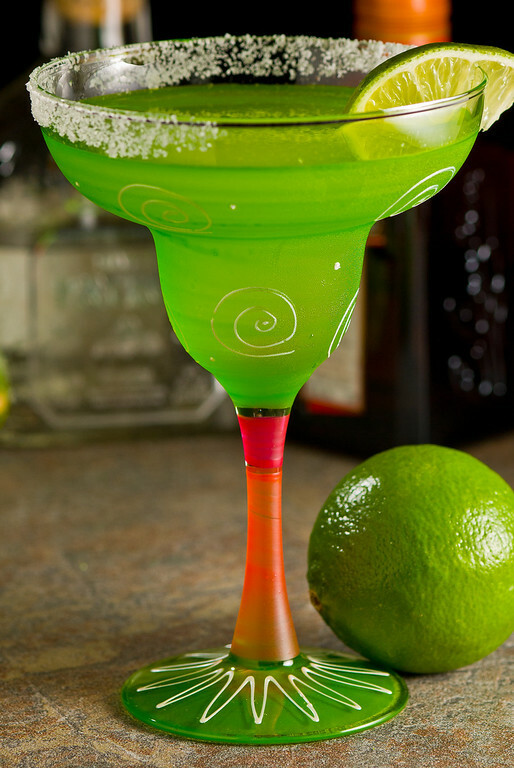 Margarita is one of the few drinks with recognizable glassware, the party-esque deep-bottomed coupe. There are many theories on how that glass came about, and came to be associated with the Margarita. Whatever the history, it’s practical to consider that it maximizes the saltable rim, and is definitely a boon to salt lovers. I am glassware agnostic when it comes to the Margarita, though the only sensible way to serve it if you want to add ice is a rocks glass. Oh, and don’t forget the salt! The salted rim is the hallmark garnish for the Margarita, and it goes beautifully with the rest of the flavors in this drink. I prefer to limit the salt in my diet, so I usually make the Margarita without the salt rim, or with a half rim, so I can avoid it I want to, but sneak the occasional taste along the way. “Margarita — the Tequila Daisy” at cold-glass.com : All text and photos © 2011 Douglas M. Ford. All rights reserved. I know so little about cocktails compared to you, but started making fresh Margaritas some years ago. It’s really not all that much work, and they taste so wonderful. I can’t bear the thought of buying a mix — squeezing a few limes is really not that hard, and the outcome is sooooo good! Glad you posted your recipe. I’ll try it and see if it’s better than the one I use. I find it funny that if you use Cointreau and a reasonably good tequila, they charge $10-$12 per Margarita if you order the same type of Margarita in a restaurant — it’s some kind of “special” Margarita. Yeah, right. Special because of how little product they actually use to rope you into paying that much for a drink! I use Cointreau in mine and have yet to go through an entire bottle of the stuff!!! There’s absolutely nothing like fresh juice, and it always pleases me to hear from people who’ve discovered that simple bit of magic. I look forward to hearing how your recipe differs from the one posted here—especially since this one is more “representative” than locked in. There are some days when I want a more pungent, citrusy drink, and some days when a little lighter approach is just the thing. And some days when I’m very naughty and drink Margaritas just for the salt. Run a wedge of lime, if using, around rims of two glasses. Invert each glass; dip rim into salt. Set aside. Combine sugar and lime juice in a bowl; stir until dissolved. Pour into a blender. Add tequila, Cointreau, and ice; process until smooth. Divide between two glasses; garnish with lime wedges, if using, and serve. For strawberry margaritas, add 1 cup sliced, frozen fresh strawberries (do not salt rim). Yes Julee, many people are so used to the giant glass of sour mix that I have seen several places calling their true Margaritas a “Margarita Martini” and like you said charging a whole lot for it. As far as recipe, the 3:2:1 was my standard: 1.5 oz tequila, 1 oz triple sec, 0.5 oz lime juice. Another recipe I like is 2 oz tequila, 3/4 oz lemon/lime juice mix, 3/4 oz triple sec and 1/4 oz simple syrup, although it hits me in the back of the throat for some reason. Cointreau and Citronge are my favorite orange liqueurs so far, and Lunazul is my favorite affordable tequila. I like to use reposados in my Margaritas. After I thought about it I realized I have to check my recipe, Doug. I think I might be making Margaritas with Grand Marnier, not Cointreau! Which you say muddies the flavors, so I will have to see what I’ve been using. And that splash of soda sounds good — I like the lift soda gives to drinks. And yes, the salt is, imo, essential! It’s such a lovely contrast to the sweetness of the drink. I lick my lips like a cat when I drink a Margarita — to get all the salt! When I get home I’ll check my recipe and post it for you. Nick: I never use drink mixes. I think juicing a lime or a lemon is just not that hard, and real juice (orange, too) makes a drink so much tastier. I am not a bartender by any means, but if I make a drink I use real juice. I’ve never bought a drink mix and never intend to! I use Grand Marnier in mine and I love it. I will have to try your recipe. I just bought a bag of Key Limes to try in it. I am curious as to how that will taste vs the regular limes. I love your margarita glass. Did you pait it will puff paint? I would love to have a glass like that. I’ve never tried a Margarita with Key limes. You’d have a little extra effort in juicing the little guys, but their tartness might be a really good choice if you don’t like your drinks too sweet. As for the glasses, I’m not a good help for you—I received them as a gift, so I don’t know where they were sourced. Google is probably your best friend on that one. Let us know how the Key Lime Margaritas turn out. Opps typo, I forgot the n in paint on one word. Late to the party here, but I have been making margaritas on the 7:4:3 recipe prescribed by the IBA, so, 35 mL tequila, 20 mL triple sec, and 15 mL lime juice, and find that it works quite well. Or if I am in the mood for something more on the tart side, I reverse the lime juice and triple sec. What are your thoughts on plata vs. reposado tequila? I see you recommend plata/blanco here, but I feel like I usually see them being made with reposado. Quosquos, I’m embarrassed that I missed your comment when it first arrived. I don’t have a strong opinion on the question of plata v. reposado. I think of the Margarita as a crisp drink, which may be what inclines me toward the plata, but I enjoy the drink either way. It’s interesting to taste Margaritas side by side, one with plata, one with reposado, to identify your favorite. Perhaps it comes down to what mood you’re in on a given day? It’s interesting to ponder, thanks for asking.